It's always hard to keep track of which waterfall is which. 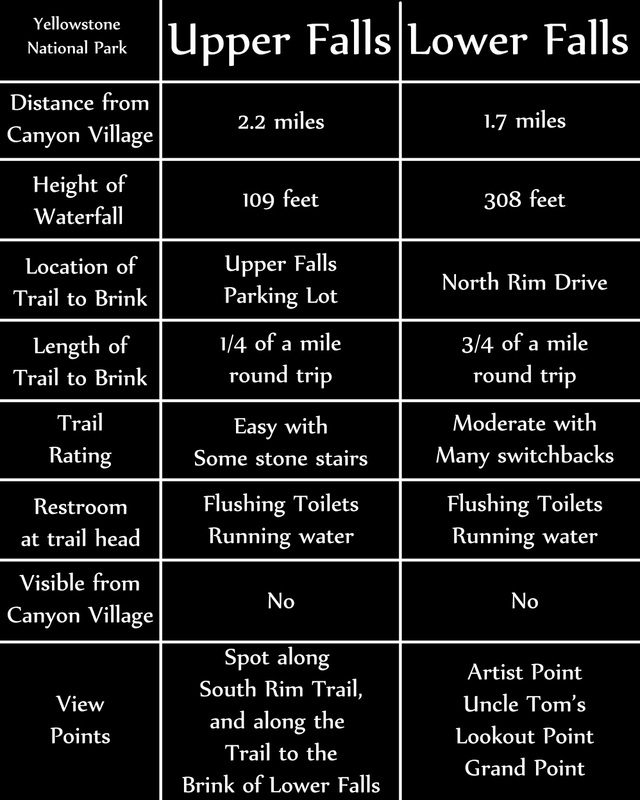 To help you out I created this little comparison chart. Both Waterfalls are only a few miles south of Canyon Village. Upper Falls is slightly farther away though. You'll want to plan to drive your car to both waterfalls as there really aren't any direct trails from Canyon Village to either waterfall. Upper Falls has it's own little road that leads to the parking lot for the Upper Falls Trail head. This is where you can start hiking on the trail to the Brink of the Falls. This whole area will be closed for trail reconstruction from July 2018 until the summer of 2019. The trail head for the Brink of the Lower Falls is located on the North Rim Drive. It is the first parking area you come to on that road. If you want to stand on the edge of a waterfall without much effort, then you want to visit Upper Falls. The trail is only 1.4 of a mile round trip. The trail to the Brink of Lower Falls is longer. It is 3/4 of a mile round trip. In addition to being short, the trail to the Brink of Upper Falls is also fairly easy. It follows a paved road for most of the way before descending about 20 stone steps. The trail to the Brink of Lower Falls is a different story. It is considered moderate and is made up of mostly switch backs. Both trail heads have pretty good restroom facilities. The restrooms have flushing toilets and sinks with running water. Neither waterfall is visible from Canyon Village. 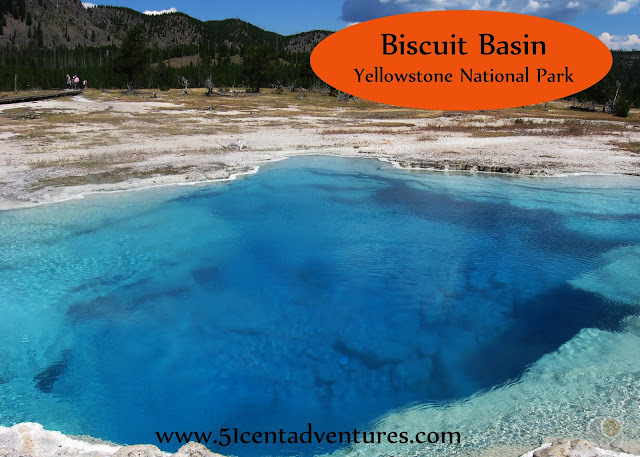 You will have to plan to drive to either the trail heads or the view points to see the waterfalls. There are only two places to view Upper Falls. One is from an overlook along the South Rim Trail. This trail is currently closed for reconstruction. It will be open again in July 2018. You can also see Upper Falls on the North Rim as you hike on the trail to the Brink of Lower Falls. 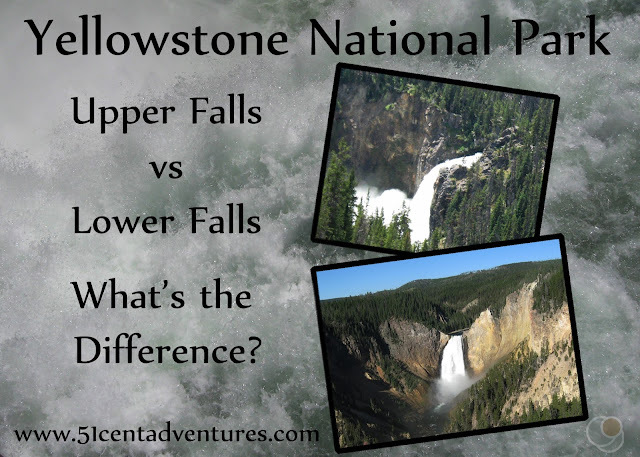 There are four main places to see Lower Falls. On the South Rim of the Canyon you can view the waterfall from Artist Point and the Uncle Tom's Trail. You can also see the waterfall as you walk along the South Rim Trail. The South Rim Trail and Uncle Tom's Trail will be closed until July 2018. On the North Rim of the Canyon you can view Lower Falls from Lookout Point and Grand Point. There is a spur trail from Lookout Point that will take you down to Red Rock Point. You can also see the waterfall as you walk along the North Rim Trail. 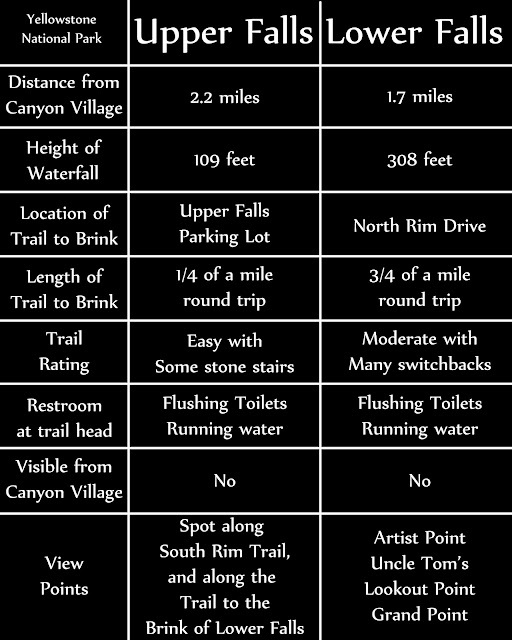 Hopefully that helps clear things up for you as you research the waterfalls in the park. If you remember nothing else, remember this: Upper Falls is the waterfall you can get close to without much effort. And Lower Falls is the big waterfall you see in pictures of the park. Both waterfalls are beautiful and worth a visit. Follow these links to read my other posts and learn more about visiting these waterfalls.